UP Big Boy 4014 going home for restoration. Received the following note along with links to this story from one of our correspondents in NW Pennsylvania. Here is an article from Los Angles ABC affiliate KABC-TV about the move of Big Boy 4014 from California to Wyoming. COLTON, Calif. (KABC) -- A massive steam locomotive known among rail fans as "Big Boy 4014" hit the tracks Monday for the first time in more than half a century. Many people were up before dawn for a chance to see one of the largest steam locomotives ever built on the rails once again after sitting in a museum at the Los Angeles County Fairgrounds in Pomona for more than 50 years. The locomotive is being towed all the way to Cheyenne, Wyo., where it will be fully restored and made to run on steam once again. 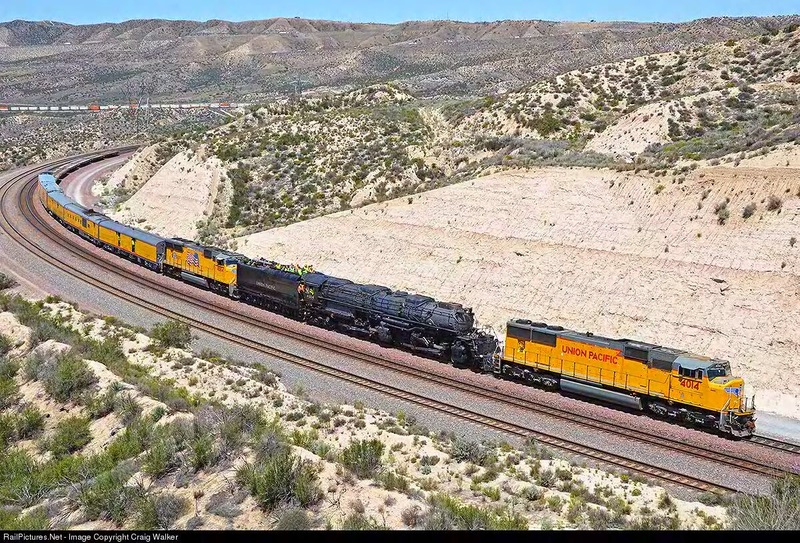 "Lots of mechanical work, all the drivers, new tires, axles, wheels -- many, many new components to make the locomotive serviceable," said Ed Dickens with Union Pacific. Railroad fans came from all over to watch. Brandon Bedke's dad says he wouldn't allow his son to miss this big day. "Pulled him out of school because this is a once in a lifetime opportunity to see something like this," said Chris Bedke of Rialto. When Big Boy 4014 returns, it will be under its own power and you'll be able to ride it. But that won't be for at least another five years. Finally, here is a picture from RailPictures.Net of the train pulling the Big Boy 4014 on Cajon Pass taken on 4-28-14 by Craig Walker. Jacksonville, Fla. – April 28, 2014 – CSX Corporation (NYSE: CSX) announced that Corporate Responsibility (CR) Magazine recognized the company on its 100 Best Corporate Citizens List. CSX ranked 75th among 100 public companies with a strong commitment to social responsibility, and was the only railroad named to the list this year. As part of the company’s efforts to protect the environment, CSX has spent more than $1.75 billion over the past decade to update its fleet with fuel-efficient locomotives and technologies. In 2012, the company set a goal to reduce greenhouse gas-emission intensity by 6 to 8 percent by 2020. Further, CSX’s dedication to the communities it serves can be seen through its employee engagement programs, community investment projects and partnerships with organizations such as City Year, the National FFA Organization, the Alliance for Community Trees and the Nature Conservancy. First named to the list in 2012, CSX’s position on the list is a reflection of the company’s commitment to sustainable operations, citizenship and strong corporate governance – all which are deeply rooted in the company’s values and culture. CSX will soon publish its fourth annual Corporate Social Responsibility report which provides a comprehensive view of the company’s initiatives including its environmental and financial performance and its role as a corporate citizen in 2013. The report is one example of the company’s dedication to transparent communications with its many stakeholders including customers, investors, employees, and community members within its 23-state territory. The 100 Best Corporate Citizens List is compiled based on 298 publicly-available data points in seven categories, including employee relations, philanthropy, environment, climate change, governance, human rights, and finance. For more information about the Best Corporate Citizen list, visit CR Magazine website, www.thecro.com. For more information on CSX’s social responsibility efforts and current activities, please visit www.csxcsr.com and www.beyondourrails.org. Received the following from one of our correspondents in NW Pennsylvania. RR Friend Terry Sponsler caught this new General Electric 'Fuel Test Train' on CSX Transportation's rails in Willard, Ohio this afternoon (4-24-14). 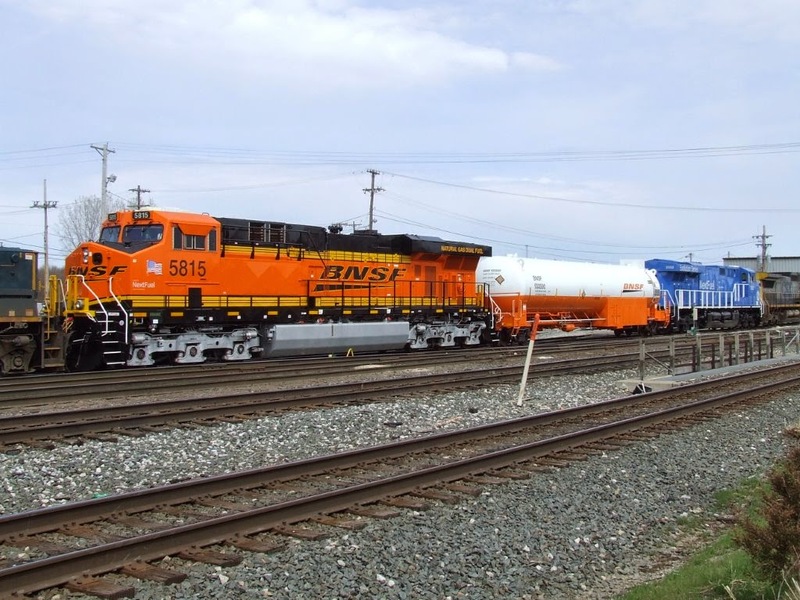 The two locomotives bracketing the orange and white Natural Gas (Cryogenic Natural Gas - CNG) fuel tender tank car are both duel-fuel diesel-electric locomotives that can run off regular diesel fuel or CNG. Success with this evolving technology could ultimately spell even busier engine assembly lines at the Grove City GE Diesel Engine Plant here in Mercer County. 12th NERPM is May 30-31 in Collinsville, Conn. The 12th New England/Northeast Prototype Modelers Meet is Friday and Saturday, May 30-31, in Collinsville, Conn. (Northwest of Hartford) Layout and MassCentral Railroad open houses are scheduled for Sunday, June 1. The meet consists of more than two dozen clinics/programs, a large model display and great vendors and manufacturers. We have several hands-on clinics scheduled, including one on modeling New Haven and Boston & Maine RPOs that requires preregistration and an extra fee. Please check the tentative schedule for more details. We also have a few openings for vendors. Questions or comments can be directed to me. Three ways to ride a caboose at BR&W! During 2014 we are offering three different ways to experience a caboose ride at Black River & Western! Online reservations are now available for all three of these options through our website and this email! Each of these options requires an advance reservation. So read up on the details and book your caboose today! Saturday May 24, 2014 to Sunday August 31, 2014 Reserve your own caboose on a regularly scheduled Summer Excursions departing Flemington, NJ! The caboose seats approximately 10 people, plus up to about 8 additional lap-riders. You are welcome to bring food and drinks. Restrooms are not available on board. You will board your caboose at Flemington Station, ride to Ringoes, and return to Flemington, OR if you choose the option of TWO round-trips, you can stick around for another round-trip! NORFOLK, VA. – Norfolk Southern reported first-quarter net income of $368 million, or $1.17 per diluted share, compared with $450 million, or $1.41 per diluted share, earned in the same period of 2013. First-quarter 2013 net income included a $60 million, or $0.19 per diluted share, gain from a land sale. § Railway operating revenues totaled $2.7 billion. § Income from railway operations was $667 million. § Net income totaled $368 million. § Diluted earnings per share of $1.17. § The railway operating ratio was 75.2 percent. Railway operating revenues were $2.7 billion, 2 percent lower compared with first-quarter 2013, and shipment volumes decreased 1 percent. § Chemicals, up 12 percent. § Intermodal, up 4 percent. § Metals/Construction, down 1 percent. § Paper/Forest, down 3 percent. § Coal, down 15 percent. For the first quarter, general merchandise revenues were $1.6 billion, 1 percent higher than the same period last year, despite overall volume declining 1 percent. Increased crude and liquefied petroleum gas shipments were offset by declines in automotive, metals/construction, and paper/forest shipments. 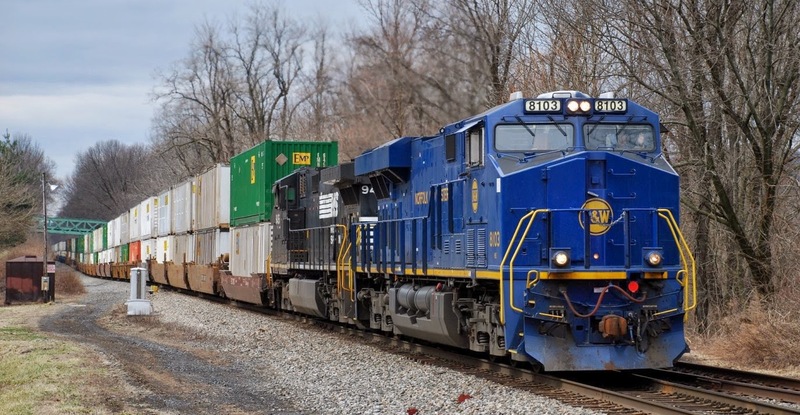 Intermodal revenues improved 4 percent, to $596 million, compared with first-quarter 2013. Growth primarily in domestic business pushed traffic volume up 3 percent in the quarter compared with the same period of 2013. First-quarter coal revenues were $541 million, 15 percent lower compared with the same quarter of 2013, the result of a 13 percent volume decrease due primarily to lower utility and export shipments. Railway operating expenses for the first quarter were $2 billion, 1 percent lower than in the same period of 2013. Income from railway operations was $667 million, 3 percent lower compared with first-quarter 2013. The quarterly railway operating ratio, or operating expenses as a percentage of revenue, was 75.2 percent versus 74.8 percent in the same period of 2013. Received the following one line announcement from Walthers. Effective immediately Model Power is closed. All backorders will be cancelled and all items will be deleted. - CSX sponsored the Anacostia Watershed Society Earth Day Cleanup in Washington D.C. and Maryland, where over 2,000 volunteers cleaned up 24 locations along the shores of the Anacostia River and tributaries in Prince George's and Montgomery Counties. - Employees are participating in cleanup events in nearly half the states in CSX's network including: Atlanta, Ga.; Avon, Ind. ; Baltimore, Md. ; Barboursville, W.Va.; Cincinnati, Ohio. ; Chambersburg, Pa.; Jacksonville, Fla.; Nashville, Tenn.; Richmond, Va.; Riverdale, Ill.; Selkirk, N.Y.; South Charleston, W.Va.; Tampa, Fla.; Toledo, Ohio; and Waycross, Ga.
- This year, CSX again sponsored the City of Jacksonville's Earth Day Poster Contest to help raise environmental awareness among students. Children grades K-12 created posters that reflect the contest's theme: "Nature's Calling - Are You Listening?" CSX also sponsored the Jacksonville Ecology Fair, which featured educational displays, live entertainment and giveaways while reminding participants about the importance of protecting and preserving the environment. CSX continues to invest in innovative technologies and initiatives to further its sustainability goals. CSX has improved its fuel efficiency by 100 percent since 1980 and the company continues to make progress on its voluntary goal to further reduce GHG emissions intensity by 6 to 8 percent by 2020. In 2013, CSX was recognized on the Dow Jones Sustainability Index, CDP's Global 500 Performance Leadership Index and the S&P 500 Performance Leadership Index for its leadership in environmental performance. NORFOLK, VA. – Norfolk Southern Corporation today announced the regular quarterly dividend of 54 cents per share on its common stock, payable on June 10, to stockholders of record on May 2. Since its inception in 1982, Norfolk Southern has paid dividends on its common stock for 127 consecutive quarters. Location is Montgomery Township, Somerset County, New Jersey. MONTGOMERY – Township residents and commuters who travel County Route 601 will soon see a newly redesigned railroad crossing that will enhance safety and is expected to lead to a “quiet zone” designation that will reduce train-horn noise. “This project will provide much-needed respite from train noise in a well-populated residential area,” said Somerset County Freeholder Deputy Director Mark Caliguire, a former township mayor. The project is intended to improve safety at the crossing by installing a median island on CR 601, which will facilitate the completion of the installation of four quadrant gates at the crossing. The four quadrant gates will prevent vehicles from entering the crossing after the gates have dropped. The work is expected to be completed by April 21. As an added benefit, once the four quadrant gates are active, the crossing likely will meet Federal Rail Administration (FRA) quiet-zone requirements. Somerset County then can apply for a quiet zone at this crossing to reduce the noise associated with train horns. By increasing the safety at the crossing to the levels approved by the FRA, the train operator will be instructed to sound the horn only in an emergency, and not every time a train approaches the crossing, as happens currently. The total project cost is $194,000, with $160,000 coming from an NJDOT Rail grant. JACKSONVILLE, Fla. - April 15, 2014 - CSX Corporation (NYSE: CSX) today announced first-quarter net earnings of $398 million, or $0.40 per share, down from $462 million, or $0.45 per share in the same quarter of 2013. For the quarter, revenue grew 2 percent to $3.0 billion on volume increases of 3 percent, with strength in intermodal and merchandise markets more than offsetting declines in coal. However, operating income declined 16 percent to $739 million and the operating ratio increased 520 basis points to 75.5 percent, primarily due to the impact of harsh weather. CSX estimates that weather-related disruptions increased expenses by approximately six cents per share, and impacted revenue contribution by about two to three cents. "The company is indebted to the dedicated men and women of CSX who worked tirelessly through one of the worst winters on record to keep the network running as fluidly as possible," said Michael J. Ward, chairman, president and chief executive officer. "Thanks to the hard work of our employees, service levels are gradually recovering, and we are capitalizing on an economy that continues to show positive momentum." 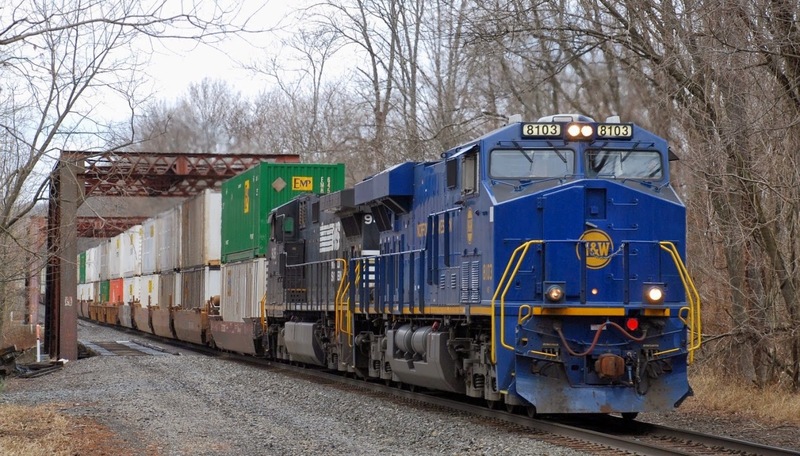 Looking forward, CSX expects modest full-year earnings growth for 2014 on the strength of broad-based merchandise and intermodal gains and an improving domestic coal environment. In addition, the company remains confident in its ability to sustain double-digit earnings growth and margin expansion for its shareholders in 2015 and beyond. The company expects to sustain a mid-60s operating ratio longer-term. CSX also announced that its Board of Directors approved a 7 percent increase in the company's quarterly dividend to $0.16 per share, payable on June 13, 2014 to shareholders of record at the close of business on May 28, 2014. This announcement builds on 11 increases over the past 8 years, representing a 20 percent compound annual growth rate during that time. It is consistent with CSX's view of the strength of the business and the company's approach to deploying cash within a balanced framework to support long-term value creation through investment, dividends, and share buybacks. CSX executives will conduct a quarterly earnings conference call with the investment community on April 16, 2014, at 8:30 a.m. Eastern time. Investors, media and the public may listen to the conference call by dialing 1-888-EARN-CSX (888-327-6279) and asking for the CSX earnings call. Callers outside the U.S., dial 1-773-756-0199. Participants should dial in 10 minutes prior to the call. In conjunction with the call, a live webcast will be accessible and presentation materials will be posted on the company's website at http://investors.csx.com. Following the earnings call, an internet replay of the presentation will be archived on the company website. JACKSONVILLE, Fla. - April 9, 2014 - CSX (NYSE: CSX) today renewed its partnership with a syndication of minority-owned banks led by Citizens Trust Bank of Atlanta (CTB). The agreement marks the tenth anniversary of the relationship, part of the CSX commitment to working closely with businesses in the communities it serves. "At CSX, we recognize and applaud the role of local entrepreneurs in promoting the health of our nation's economy and growing jobs in their communities," said Michael J. Ward, chairman, president and chief executive officer, CSX. "We are proud to continue this decade-long partnership with the Citizens Trust Bank of Atlanta and its syndication, a prime example of a partnership helping make the diverse communities where we live and work more sustainable and prosperous." Along with Citizens Trust Bank, the syndication includes Seaway Bank and Trust Company, City National Bank of New Jersey, Commonwealth National Bank, Mechanics and Farmers Bank, United Bank of Philadelphia, and Citizens Savings Bank & Trust Company. "A collaborative partnership such as our lasting relationship with CSX helps to establish and achieve common goals," said Cynthia N. Day, president and chief executive officer, Citizens Trust Bank. "This kind of insightful approach allows the promise to sustain the growth of the community, to continue to deepen existing relationships and attract future generations of banking customers." CSX's commitment to promoting small businesses is also reflected across its supply chain through its minority supplier development program, which actively seeks to establish relationships with minority-owned businesses. In 2013, CSX was recognized as one of DiversityInc's Top 25 Noteworthy Companies, for its commitment to diversity throughout the company's operations. Citizens Bancshares Corporation is the parent holding company of Citizens Trust Bank that provides a full range of commercial and personal banking product and financial solutions. For over 90 years, Citizens Trust Bank is committed to enabling their customers and the community to realize dreams of economic empowerment. The Bank has remained dedicated to the growth and development of communities through its commitment to excellence. Citizens Trust Bank has financial centers throughout metropolitan Atlanta and Columbus, Georgia, and in Birmingham and Eutaw, Alabama. Through its parent company, Citizens Bancshares Corporation, its common stock is offered over-the-counter to the general public under the trading symbol CZBS. For more information please visit Citizens Trust Bank on the web at www.ctbconnect.com. Like us on Facebook (https://www.facebook.com/ctbstrong) and follow us on Twitter (http://twitter.com/ctbank). Citizens Trust Bank - A relationship you can bank on. NS's N&W heritage unit 8103 is number five! Thanks to the Internet I learned that NS's heritage unit N&W would be leading 20R (Chicago-Calumet, IL to E-Rail, NJ) Intermodal on only its second trip into NJ on Saturday morning. Even the weather was cooperating by providing partly cloudy skies. Back in October, 2013 it had some internal problems as a result of a mishap in Pennsylvania. In April the repairs were completed and it was placed in service on an NS ethanol train 64K into NJ and returned on a 65K. A quick turn around found it leading 20R for its next assignment with the railfan community trackside ready to record its return! The first image sees 20R heading east on the LEHL at MP 68.8 in Bloomsbury (NJ). The dispatcher instructed 20R to hold the siding at CP 67 for westbound 11J. Once that train passed, 20R would continue its trip east to E-Rail. That temporary stop would also allow me time to get 20R as it crossed over the Raritan River and Cramers Creek dual truss bridges west of the Hamden Road grade crossing in Hunterdon County (LEHL MP 57). Snapping that image enabled me to capture my fifth heritage unit with only fifteen more to go! NORFOLK, VA. – A new season of “21st Century Steam” train excursions has launched, with Norfolk Southern Corporation and partners Tennessee Valley Railroad Museum and Fort Wayne Railroad Historical Society scheduling 18 excursions in seven states from April through July. Tickets for the trains listed below are available through the websites of TVRM (www.tvrail.com) and FWRHS (www.fortwaynerailroad.org). Some trains are Norfolk Southern employee specials as noted on the schedule and are not available to the general public. All excursions are round trip. Here is the schedule through July 13. Grundy, Va. – Devon, W.Va.
Chicago, Ill. – Argos, Ind. Cincinnati, Ohio – Danville, Ky.
Lexington, Ky. – Oneida, Tenn.
Chattanooga, Tenn. – Oneida, Tenn.
Detroit, Mich. – Fort Wayne, Ind. Southern Railway No. 630 was built in 1904 by American Locomotive Company at Richmond, Va., and has been a mainstay of 21st Century Steam excursions after having been rebuilt in TVRM’s Chattanooga shops. Nickel Plate Road No. 765 was built in 1944 by Lima Locomotive Works at Lima, Ohio, and is familiar to many railroaders, having been in excursion service on and off since 1979. On June 7, TVRM will operate the Steam Anniversary Special in recognition of the 50th anniversary of the 1964 train from Stearns, Ky., to Chattanooga that led to Southern Railway’s launch of a steam excursion program the same year. The June 6, 1964, train was powered by Southern Railway Locomotive 4501, which now is being rebuilt at TVRM’s Chattanooga shops. Southern’s excursion program operated from 1964 to 1994. In 2010, Norfolk Southern and TVRM announced plans to launch “21st Century Steam” to highlight milestones in rail history and provide opportunities for audiences to learn about today’s safe and service-oriented freight railroads. The inaugural excursions took place during Labor Day weekend 2011, powered by the 630.